Home International Economic Law Archive for category "Bilateral Investment Treaties"
Editors’ Note: This is the latest post in our ongoing series of posts (see introduction here, first post on costs here, second post on duration of proceedings here, third post on the diversity deficit in investment arbitration here, fourth post on the impartiality and independence of arbitrators here, fifth post on an empirical assessment of ISDS here) authored by individual members of the Academic Forum of the UNCITRAL Working Group III (UN WG III) on Investor-State Dispute Settlement Reform, in parallel with the ongoing UN WG III sessions taking place this week in New York. The series features summaries of more detailed concept papers prepared by various working groups of the Academic Forum. This post summarizes a more detailed concept paper prepared by members of Academic Forum Working Group 4 (members Daniel Behn, Chi Manjiao, Eric De Brabandere, Anna De Luca, Jaemin Lee, Martins Paparinskis, Catharine Titi). In UNCITRAL Working Group IIIdiscussions, concerns have been raised about the consistency, as well as the correctness, of investor-State dispute settlement (ISDS) decisions. Consistency and correctness are distinct concepts: inconsistent ISDS decisions can be correct, and consistent ISDS decisions can be incorrect. Developing potential policy responses to incorrect ISDS decision-making first requires an understanding of how achieving correctness requires more than achieving consistency. Editors’ Note: This is the latest post in our ongoing series of posts (see introduction here, first post on costs here, second post on duration of proceedings here, third post on the diversity deficit in investment arbitration here, fourth post on the impartiality and independence of arbitrators here) individual members of the Academic Forum of the UNCITRAL Working Group III (UN WG III) on Investor-State Dispute Settlement Reform, in parallel with the ongoing UN WG III sessions taking place this week in New York. The series features summaries of more detailed concept papers prepared by various working groups of the Academic Forum. This post summarizes a more detailed concept paper prepared by members of Academic Forum Working Group 7. The legitimacy crisis in international investment arbitration continues to generate attempts at systemic reform. The latest act is playing out in the theatre of UNCITRAL, which is wrestling with issues such as excessive costs, outcome bias, and lack of arbitral independence. Yet, not everyone is certain that there is a problem and some participating states have queried the critiques and their empirical basis. So, what is the state of the evidence? Which critiques deserve serious consideration? These questions are challenging. The fragmented nature of the investor-state dispute settlement (ISDS) system and a traditional focus on doctrinal research has hindered systemic analysis. However, the rise of quantitative and qualitative research and new databases allows us to get a better grip on the evidence. The ISDS Academic Forum working group (No. 7) has reviewed and assessed the available empirical research on the central concerns in the UNCITRAL reform process, which are also the subject of other Academic Forum working group reports. These concerns are: excessive costs, lengthy proceedings, inconsistency, incorrect decisions, arbitral diversity and arbitral independence. For each issue, we asked two simple but difficult questions: (1) What do we know? and (2) Does it matter? To be sure, there is a recurrent tension in both questions. There is an epistemological challenge: some topics are under-studied or difficult to study. There is also an evaluative challenge. It is not always easy to assess whether a problem really matters – the magnitude of the concern might be unclear or the normative yardstick contested. 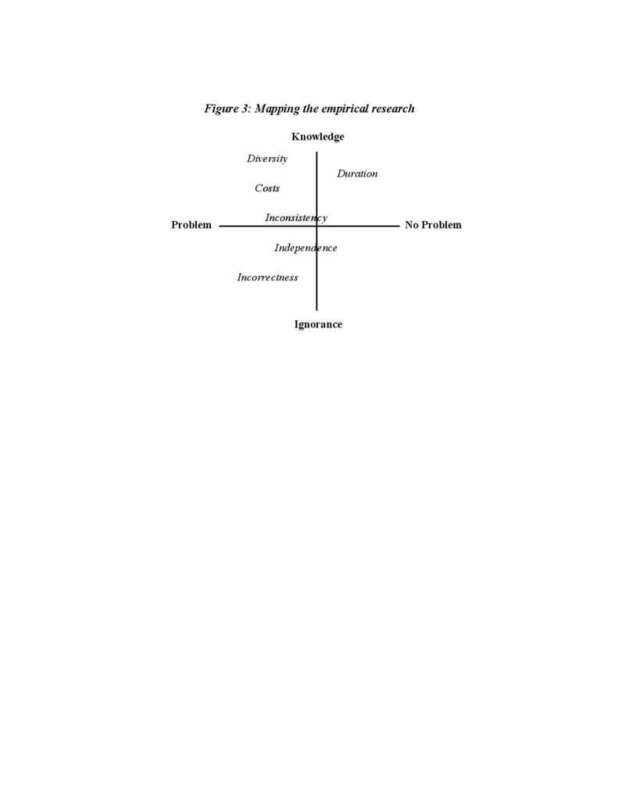 We therefore sought to map the state of evidence onto a 2*2 framework, allocating our findings to one of the four quadrants in the figure below. The findings can range from good knowledge of a concrete problem (Quadrant I) to poor knowledge of a doubtful problem (Quadrant IV). In between, we find good knowledge but no problem (Quadrant II) and poor knowledge, but likely problem (Quadrant III). The legal costs and damages associated with ISDS have been consistently and frequently studied. Expenses relating to arbitrators and tribunals (‘tribunal fees’) average about 1 million USD, constituting a fraction of the costs that a party will experience in a typical ISDS case. The most significant legal costs are those of counsel (including experts costs). The average costs of counsel for claimants is around 6 million USD and for respondents 5 million USD. Yet, compared to international commercial arbitration or complex domestic court litigation, it is still unclear whether ISDS is uniquely expensive. A typical ISDS case can now can have thousands of pages of documentary evidence. Nonetheless, a process to simplify and improve case management may be beneficial, especially for states and small investors. Enhanced transparency on tribunals’ rationale for the calculation and allocation of costs is also highly desirable, given the lack of a consistent approach. Losing states will almost always pay compensation (non-monetary damages are rare). The mostrecent study by Behn and Daza of all investment arbitration cases with known amounts awarded up through 1 February 2019 (193 cases) found an average award of 482.5 million USD, with a median of 31 million USD. Are these amounts excessive? While investors are only awarded a little over a third of what they claim on average, these awards can be significant for poorer states. The result is that while tribunal costs are more likely situated in Quadrant II (clear knowledge, not a major problem), higher counsel costs and compensation awards may be closer to Quadrant I (clear knowledge, a problem). Recent studies on the duration of ISDS proceedings provide a fairly clear picture on the nature of duration and, increasingly, the causes of delay. 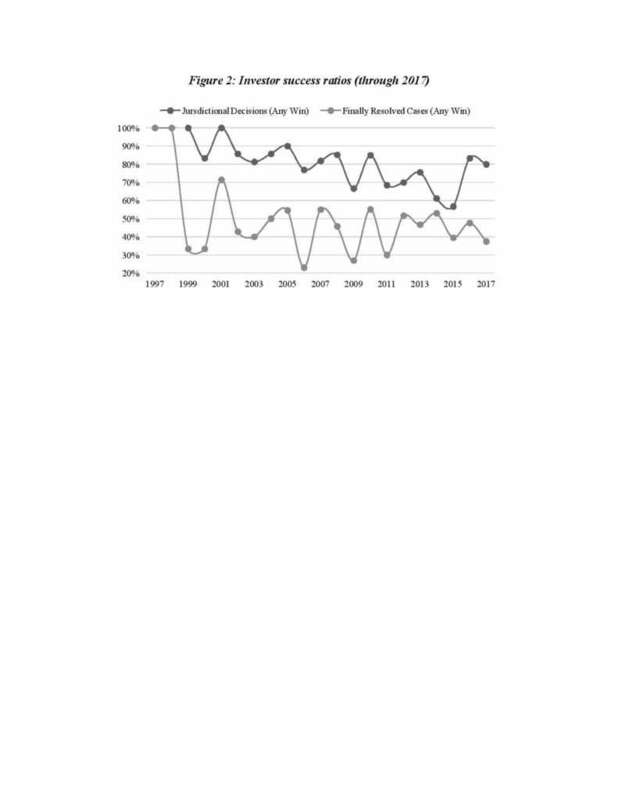 The average period for both arbitration cases and ICSID annulments is relatively constant at 3.73 and 1.91 years respectively with a slight decrease in the past 5 years. But it is less clear whether there is a problem. The length of proceedings is much shorter than in many other international adjudicative proceedings. One study indicates that it is longer than comparable litigation in some developed state jurisdictions, but not in less developed states. Moreover, recent statistical research suggests that it is the parties themselves – especially states – that are largely responsible for longer proceedings, specifically through requests to bifurcate proceedings or arbitrator challenges. This raises the question of whether delay is (or should be) a major issue for the reform process, perhaps in Quadrant II. Like doctrinal studies, empirical approaches paint a mixed picture of the consistency of decision-making in ISDS. The conclusions depend on the specific issues studied, the analytical framework, terminology and methodology used. Moreover, we should expect inconsistency for differently-worded treaties or factual situations. Citation network analysis has provided one lens of the nature and degree of jurisprudentialintegration and thus consistency.For example, Stone Sweet and Grisel trace a dramatic shift in ISDS awards from citations to other international courts to a citation network of prior ISDS awards, suggesting the system is increasingly becoming internally consistent – although not necessarily externally consistent. Moreover, additional studies have found that ICSID and NAFTA tribunals refer to case law more frequently than non-ICSID cases, marking the limits of internal consistency. Whether inconsistency is a problem depends on the importance one places on legal certainty. Quality decision-making, sociological legitimacy, and dynamic learning might be equally valued. The consistency concern may therefore fall between Quadrant I and II: some knowledge, partly problematic. Making conclusions on incorrectness is challenging for empirical methods as much as it is for doctrinal methods. On one hand, some authors and actors dispute that the ISDS system is biased and point to the even-handedness in final outcomes: see figure 2. Strezhnev finds also thatdeveloping countries lose more frequently because they are more likely to settle otherwise successful cases. On the other hand, some authors have found that the majority of arbitrators advanced a pro-investor jurisprudence and that developing countries are more likely to lose a case, even when controlling for most democratic governance indicators. Based on case studies, Sattorova also finds that ‘there is a significant current within the international arbitration community that favours the vision of investors as victims of corrupt governments.’ The results are thus mixed, pushing the issue into the ‘known unknowns’ of Quadrant III or IV. The evidence also indicates that change is sluggish across all aspects of diversity. The ‘prior experience’ norms dominates as parties have strong incentives to (re)appoint experienced arbitrators whose leanings are known. The result is a system that struggles with legitimacy and some studies suggest a more diverse group of arbitrators may partly decide differently. This issue clearly falls in Quadrant I.
Empirical research raises some real questions over the impartiality, neutrality and to some extent independence of arbitrators. A survey experiment conducted on about 250 international arbitrators demonstrates that arbitrators are more likely to choose outcomes favorable to the side appointing them. Moreover, a study on double hatting shows that up to 47% of cases (509 in total) involve at least one arbitrator simultaneously acting elsewhere as legal counsel in another ISDS case. However, empirical work on independence must proceed with caution. It is frequently difficult to demonstrate with precision the causal effects of alleged bias. However, institutional behavior such as double-hatting and party-based appointment creates at least a perceived bias and legitimate concern, putting the issue between Quadrant I and III: some knowledge and a potential problem. The survey of the empirical studies in relation to the six issue areas that the UNCITRAL Academic Forum has provided reports revealing an emerging base of evidence for assessing the ISDS process. In some cases, precise statistics can be given on the nature of the regime (legal costs, duration, diversity) and increasingly on the casual factors behind its outcomes (e.g. causes of delay, presence of bias effects on diversity on outcomes). However, the survey also indicates the limitations of an empirical perspective. The main challenges are accessto all relevant data and modelling challenges in explaining outcomes. Moreover, evaluative challenges remain – it was not always clear whether there is a normatively or empirically relevant problem. Nonetheless, in Figure 3 we have plotted our six conclusions on the epistemologicaland evaluativeaxes. In some instances, there is clear evidence of a problem (diversity, costs) or clear evidence that raises questions as to whether there is a significant problem (duration of proceedings). In other areas, we don’t know enough (inconsistency, independence, and incorrectness) although some evidence points toward a problem. Editors’ Note: This is the latest post in our ongoing series of posts (see introduction here, first post on costs here, second post on duration of proceedings here, third post on the diversity deficit in investment arbitration here) from individual members of the Academic Forum of the UNCITRAL Working Group III (UN WG III) on Investor-State Dispute Settlement Reform, in parallel with the ongoing UN WG III sessions taking place this week in New York. The series features summaries of more detailed concept papers prepared by various working groups of the Academic Forum. This post summarizes a more detailed concept paper prepared by members of Academic Forum Working Group 6 (Steven Ratner as chair, members are Jeffrey Dunoff, Shotaro Hamamoto, Luke Nottage, Stephan Schill, and Michael Waibel). The principle that adjudicators must be independent and impartial is at the core of any adjudicatory mechanism, whether domestic or international, and is a basic principle of the rule of law. It plays an important role in Investor-State arbitration (ISA), where arbitrators typically sit for a short amount of time in specific cases and are not career judges. The requirements that arbitrators be independent and impartial are usually found in the applicable rules of procedures to the arbitration, including UNCITRAL Arbitration Rules (2010) and the ICSID Convention. However, concerns over the possible or perceived lack of independence and impartiality of arbitrators have been raised by diverse ISA stakeholders, including parties and the general public. In this context, this post first identifies the issues that may rise concerns about the independence and impartiality of ISA arbitrators. It then explains how some of the reform proposals under possible consideration at UNCITRAL would or would not solve the identified problems. Editors’ Note: We continue the series of posts (see this morning’s introduction here, and first post on costs here), contributed by individual members of the Academic Forum of the UNCITRAL Working Group III (UNCITRAL WG III) on Investor-State Dispute Settlement Reform, which provide summaries of individual concept papers prepared by various Academic Forum working groups jointly authored by members therein. These posts will run simultaneously with the ongoing UNCITRAL WG III sessions in New York this week. This post, authored by Holger Hestermeyer with Anna De Luca, summarizes the concept paper on duration of ISDS proceedings, which was jointly authored by the members of Academic Forum Working Group II (Holger Hestermeyer as chair, Jose Manuel Alvarez Zarate, Crina Baltag, Daniel Behn, Jonathan Bonnitcha, Malcolm Langford, Anna De Luca, Loukas Mistelis, and Gregory Shaffer.) Clara Lopez Rodriguez and Simon Weber provided assistance. The length of proceedings, and the resulting impact on costs, has long been a topic of considerable importance for arbitration: a lack of speed is widely perceived by users as one of the downsides of international arbitration. In the current debate about ISDS reform, the length of ISDS proceedings, alongside their costs, has been raised as a concern at the thirty-fourth session of UNCITRAL Working Group III. In the following paragraphs we will try to answer the following questions: when are proceedings excessively long? How long are ISDS proceedings? What is the effect of the various reform proposals on the length of ISDS proceedings? In carrying out this evaluation the authors faced a number of challenges. Firstly, none of the reform scenarios has been intended to specifically address the duration of ISDS proceedings except for some of the improvements suggested by the scenario “Investment Arbitration (IA) improved”. As a result, the impact on the duration of ISDS proceedings is more of a collateral damage or benefit of the reform proposals under discussion and is, accordingly, not always easy to ascertain. Secondly, the length of investment arbitration is so heavily fact-specific that it seems to defy all attempts at generalisation. Thirdly, short proceedings are not automatically better proceedings. Shortening proceedings can affect dispute resolution in complex ways and involves trade-offs. These have to be made clear. On 18th January 2019, the European Commission published the draft negotiating mandates for its trade talks with the United States, which followed the US-EU Joint Statement on stepping up the bilateral cooperation summing up the Trump and Juncker’s meeting in July 2018. Putting the idea of an ambitious trade deal to the side, the mandates cover two areas where the prospects of the agreement seem less contentious – eliminating tariffs on industrial goods and stepping up conformity assessment (CA) cooperation. The latter is chosen to serve one of the main negotiating objectives of both sides to remove non-tariff barriers (NTBs) that are estimated to have even a more profound effect on trade than tariffs in some areas and thus being of particular concern to the bilateral trade relations. Stepping up CA is also listed as one of the US Negotiating Objectives recently published by the USTR, since the US identifies European CA among main trade barriers to the EU market in its 2018 Foreign Trade Barriers report.